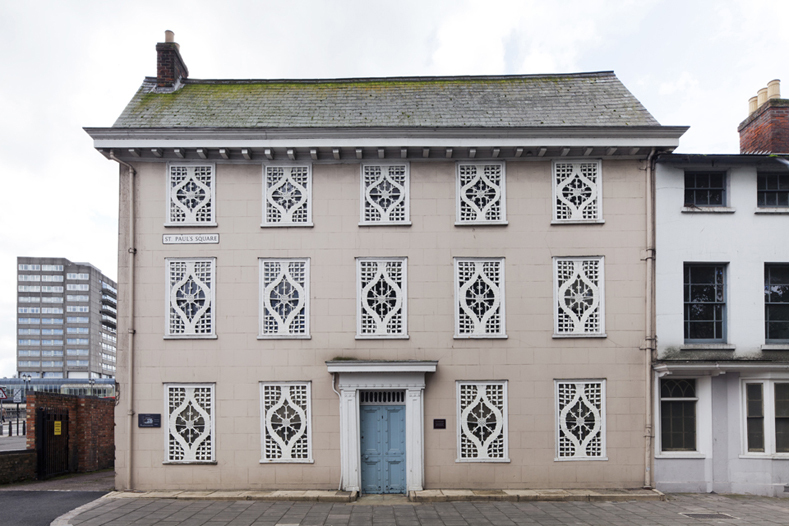 Last year, following the success of the Lace in Place project through BCA Gallery there was a resurgence in interest from local people to learn the skill of lacemaking. Marilyn Two and Sandra King of the Aragon lacemakers were keen to encourage and teach people, in order to keep the craft going and create another generation of lacemakers. I was perhaps approaching lacemaking from a different perspective, having documented a huge number of bobbins and added many thousands of lace patterns and pieces to the Museums database. Not really fully understanding what it was all about, I was inspired by the beauty of the Thomas Lester collection lace and fascinated to give it a go in my spare time. The Lace in Place project gave me the opportunity to get to know the Aragon lacemakers better and going forward the opportunity to learn Bedfordshire lace from our local experts in the field. I had only really started on the basics of ‘whole’ cloth stitch and ‘half stitch’ when a new project was afoot with the making of a lace commission for The Higgins new displays. I suddenly found myself in at the deep end. I was quite familiar with the different bits of kit needed for lacemaking having seen much of it on display at the museum and in the store. 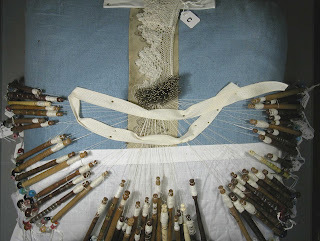 The lace pillow used today is polysterene rather than the traditional straw filled round kind, although the bobbins are pretty much the same. There is a variety of bobbins in use today, the bone ones are less common, the wooden bobbins are popular being heavier and nicer to work. Then there are the plastic bobbins, which do the job but are very light, and as I found a bit slippery – they kept unwinding themselves, which was frustrating. The bobbins cotton thread stays in place by putting a ‘hitch’ (a type of slip knot) around the top of the bobbin, which experienced lacemakers make look sooooo easy, but when you are learning it is and essential skill that is really quite hard to get right – especially when you have eight or twelve bobbins to contend with. The heart design I had started with, with just four bobbins had seemed quite straight forward and only needed one stitch repeated. Bobbins are always worked in pairs, they are wound in pairs before starting work with pure cotton thread. The design for the pattern is taken from a printed pattern, cut out and backed with card at the same size. 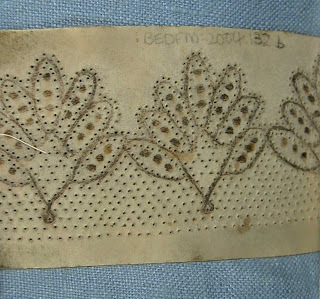 Traditional 'pricking' or lace pattern, patterns were drawn by hand or traced onto vellum and later card. Today photocopied designs are cut out from paper and backed to card using sticky-back plastic, but play the same function as earlier patterns. Holes are pricked into the material using a 'pricker'. To seal the card and paper pattern together blue sticky back plastic is used (a modern addition) – which brought back memories from my youth of covering exercise books for school. You then use a tool called a ‘pricker’ (a sharp pointed skewer) to prick holes into the pattern – hence why the pattern is sometimes also called a pricking. 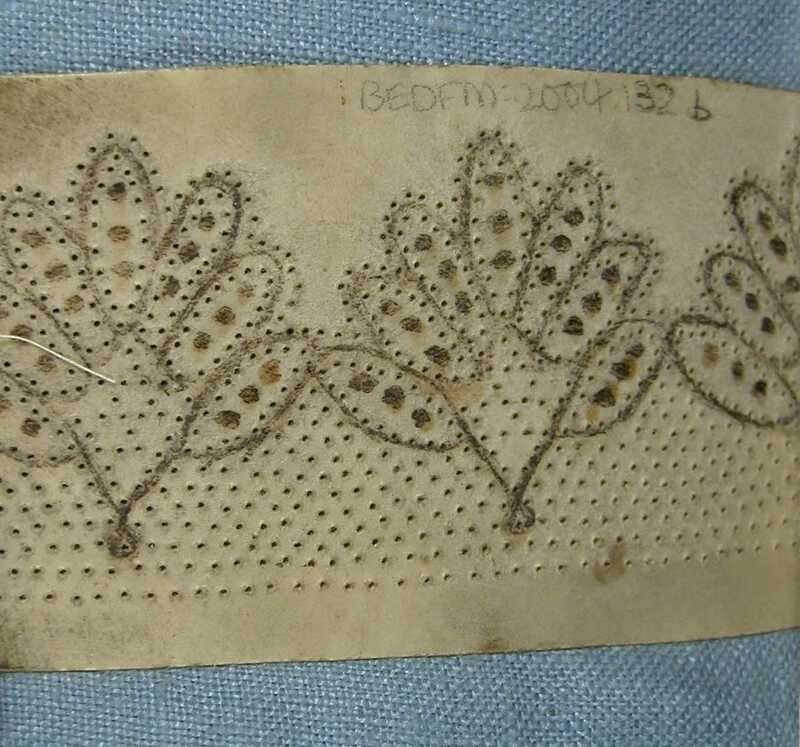 The holes pricked into the pattern are for the pins to be placed in as you work along the rows with your bobbins making the stitch. 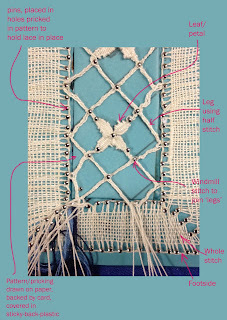 The community project piece was more challenging needing the skills of both whole stitch and half stitch, learning what a ‘footside’ was in the lace and how to create this effect. 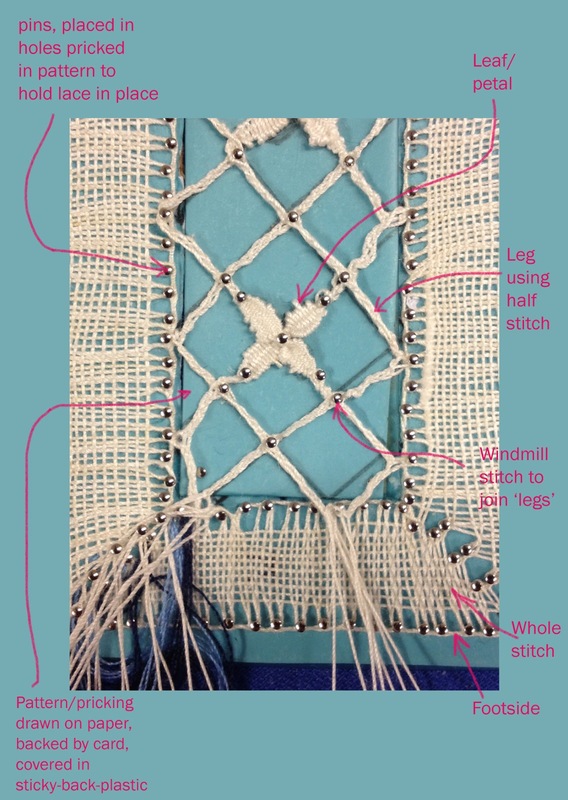 The interior design was also challenging learning how to make ‘legs’ using half stitch, and to attach more bobbins for the central design by using a pin lifter to remove a pin, and then thread through the bobbins. I also learnt how to secure the legs together by criss-crossing the bobbins in a ‘Windmill’ Stitch. The ‘leaves’ or ‘petals’ were more difficult to master, as they require a weaving finesse of four bobbins one over the other – over under over under over, then moving the two outside bobbins out and then back in to make the leaf shape. It was very satisfying to get to the end of my first leaf, having undone and redone the leaf several times before mastering a shape that I was happy with. The next thing was to make four all look the same …quite tricky for a beginner I can tell you. I was very pleased once I got to the end of my piece for the community project – it took me around 18 hours, but was well worth it for the end result. I do now feel ready for my next challenge in Bedfordshire lace and can’t tell you what a privilege it is to have experienced lacemakers taking the time to teach us learners the basics of the craft. The hours of work in the preparation of the project, the support given to the Aragon lacemakers members to get involved and the development of people’s skills in Bedfordshire lace is to be applauded. I would like to say a personal thankyou to Marilyn, Sandra and Pam for all their time and kind words of encouragement. Do come to see the finished display piece when the Higgins re-opens, I promise it will be well worth a look.